The legitimate object of government is to do for a community of people whatever they need to have done, but cannot do at all, or cannot so well do, for themselves—in their separate, and individual capacities. Infrastructure is the foundation that makes everything in the U.S. economy possible. Infrastructure is also essential to our national competitiveness. When done right, infrastructure investments produce broad-based prosperity for American businesses and workers, facilitating social mobility and enabling access to opportunities, people, and ideas. At every stage in our national development, infrastructure has played an essential role. Yet, today, many of our most valuable and productive national assets are coming to the end of their useful life and are in need of major repairs or reconstruction. Moreover, our growing population will require system expansion. For too long we have ignored the rising backlog of maintenance, preferring a reactive, patchwork approach that struggles to respond when critical systems fail—often without warning. That is why it is time to build the next generation of American infrastructure that will power our economy in the 21st century. The need for investment is overwhelming. 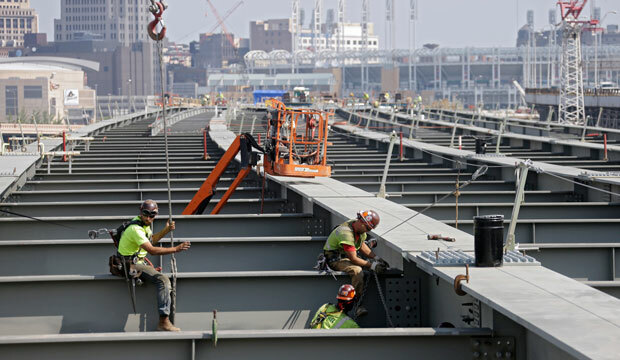 According to the American Society of Civil Engineers, American infrastructure across all sectors needs more than $3 trillion in investment to both bring systems up to a state of good repair and accommodate population growth. The concrete and steel that make up infrastructure projects are prosaic elements of our daily lives. However, they reflect the deeply American tradition of always looking to the future and making thoughtful investments that will pay dividends for generations to come. Taken together, the investments detailed in this report will serve as a significant down payment on America’s continued economic prosperity. Moreover, investing in infrastructure will provide for more strong, middle-class jobs capable of supporting a family, with money left over to save for the future. Finally, the policy reforms will address many of the shortcomings of existing programs, ensuring that increased federal outlays are well spent. Now is the time to put rhetoric aside and act big. Kevin DeGood is the Director of Infrastructure Policy at the Center for American Progress. Christian E. Weller is a Senior Fellow at the Center and a professor in the Department of Public Policy and Public Affairs at the McCormack Graduate School of Policy and Global Studies at the University of Massachusetts, Boston. Andrew Schwartz is a Research Associate on the Economic Policy team at the Center. * Correction, October 12, 2016: This report has been updated to accurately state a proposed increase in the annual outlay of the Harbor Maintenance Trust Fund, as well as the user fee revenues over baseline.